We seem to have a never-ending supply of toothbrushes, cosmetic brushes and yes, even hairbrushes around the house, so I think it's a fair guess to say you probably have a good supply of old brushes around your home too. Consider keeping them and using them as cleaning tools. Toothbrushes make great tools for cleaning around taps, getting into ornate designs on crystal and glassware and for cleaning jewellery. Flat hair brushes can be used to scrub tubs and shower tile. 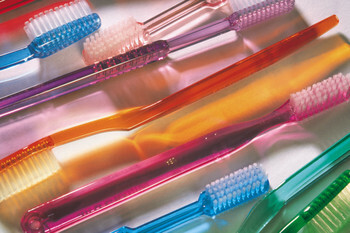 If they are a bristle brush use them to dust cloth lampshades, curtains and fabric sofas. I use old tooth brushes to dry mugs and glasses on a tea towel on the kitchen bench, that way the draining rack doesn't get filled up with larger items and more plates can fit in there. I give the brushes a really good clean and disinfext them really well. Then when I wash mugs or glasses I rinse them and stand them at an angle so the water drains out completely and they dry really well inside and out.